In today’s era of cell phones, drivers have a hard time concentrating on the road. It is a more dangerous time as the other drivers seemingly have their mind on everything but the road. To help drivers and in honor of Distracted Driving Awareness Month, Chrysler has released a list of the six ways that Uconnect helps drivers remain focused on the road and helps to keep them safe. 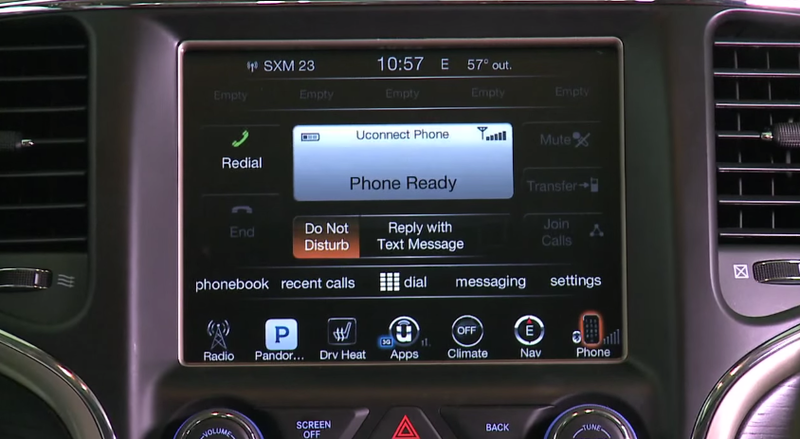 Drivers who have a Uconnect system in their Chrysler vehicle will be able to turn on a “Do Not Disturb” feature. This makes it so that the driver is not interrupted with calls or text messages while they are at the wheel. Chrysler released a video to highlight this specific feature. Uconnect has hands-free selection of various features on its system. You can simply use voice commands to select voice navigation, radio, and other things without having to divert attention away from the road. Need to find the closest Starbucks? Easy to do with just your voice using Uconnect. Even the task of turning up or down the volume on the radio is something that can be done without distraction. By having audio controls on the steering wheel, you have full control over the radio if a song is too loud. Rear back-up cameras help to provide the driver with a clearer view of what is in their rear blind spot. It helps the driver keep an eye out for anything or anyone in the way without sacrificing a view of what is ahead. This one is for Apple iPhone 4s or later models that can use Siri Eyes Free. This allows drivers to use voice commands to send text messages, play music, or use directions. Uconnect lets you text without having to make quick glances at a cell phone screen. Using a Bluetooth Message Access Profile-enabled (MAP) device, the user is able to text without taking their hands off the wheel. If you need to schedule a time for your vehicle to be serviced, contact us at Bayside Chrysler Jeep Dodge. You can also download our mobile app to schedule a time and keep an eye on the status of your vehicle once it’s been taken in. Like us on Facebook and follow us on Twitter for more service tips and specials.